Bring your son or daughter to learn kids self defence and have fun. 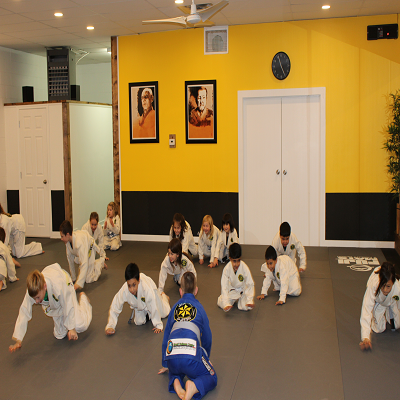 Through a combination of "verbal kids self-defence" kickboxing and ground-fighting Jiu Jitsu, your child will learn our kids self defence through our Bully Proofing/Anti-Abduction program - along with respect and discipline! Our kids self defence program is open for kids from 5 to 12 years old. Your child will learn valuable skills with regards to dealing with strangers and bullies. Our kids self defence programs will help on developing behavioral and attitudinal aspects inherent with martial arts such as respect, confidence, discipline and control. Through providing a fun and safe atmosphere for kids, we can foster a healthy environment in which they can learn and develop not only self- defense skills, but life skills as well.